In August, the local market saw rising numbers of new listings and list and sales prices, but the number of residential sales dipped slightly. 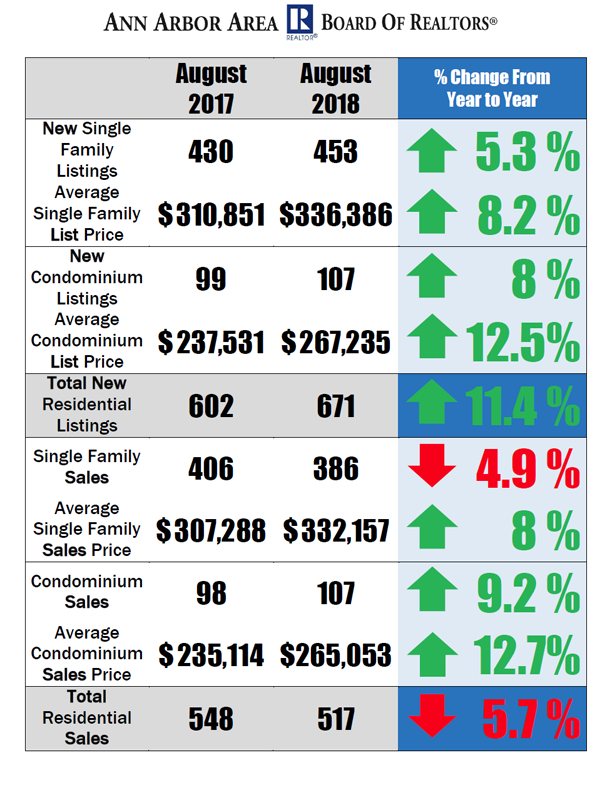 New single family listings were up 5.3% and new condominium listings were up 8% in August 2018, compared to August 2017. The average list price for single family homes jumped 8.2% in August 2018 to $336,386, compared to an average of $310,851 in August 2017. Similarly, the average list price for condominiums in August 2018 rose 12.5%, with an average price of $267,235, compared to an average of $237,531 in August 2017. Single family home sales dropped 4.9% in August 2018, with 20 fewer sales in compared to August 2017. In contrast, condominium sales were up 9.2% compared to August 2017. While total residential sales for August 2018 dipped 5.7%, the average sales price of single family homes and condominiums were up from August 2017. The average sales price of single family homes in August 2018 was $332,157, an increase of 8%, and the average sales price of condominiums in August 2018 was $265,053, an increase of 12.7% compared to August 2017. National Association of REALTORS® Chief Economist Dr. Lawrence Yun delivered an economic outlook and forecast of our local market at our September 13 General Membership Meeting and concluded that the overall outlook was good for our market, with national existing home sales inching higher over the next 2 years. To see his full presentation, view a recording here. To see more Ann Arbor Area housing statistics, view the August 2018 Housing Statistics Report.